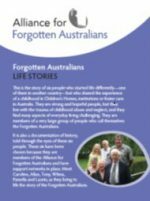 In 2008, AFA produced 90,000 copies of a booklet about Forgotten Australians. It is informative and useful for Forgotten Australians and those who work, interact or relate with them. This booklet can be viewed by clicking the following link it in PDF format. You can also receive a free copy of this booklet by post or order a box for distribution. To place your order contact the secretariat on admin@forgottenaustralians.org.au or by phone on 0419 854 980. Around 500,000 children shared the ‘care’ experiences of these six in the 20th Century. Many of those children were abused physically, sexually and emotionally. Many were denied access to proper health care, to education and to affection. They lived a life of hard work and deprivation. The trauma is always with them; such deep-seated experiences in childhood have a profound effect on the security, resilience and self-belief of adults. Telling their story is important to Forgotten Australians. Although it is painful for them, they want their history recognised. Unpleasant truths are better understood than kept in darkness. We also learn from the past: firstly, how to assist the adult survivors of child abuse, building on their strengths and understandings, and secondly, how to support children today. This is the story of six people who started life differently—one of them in another country—but who shared the experience of a childhood in Children’s Homes, institutions or foster care in Australia. They are strong and hopeful people, but they live with the trauma of childhood abuse and neglect, and they find many aspects of everyday living challenging. They are members of a very large group of people who call themselves the Forgotten Australians. It is also a documentation of history, told through the eyes of these six people. These six have been chosen because they are members of the Alliance for Forgotten Australians and have support networks in place. Meet Caroline, Allan, Tony, Wilma, Pamella and Laurie, as they bring to life the story of the Forgotten Australians. This DVD is an educational resource, aimed at providers of welfare, health and other services who will work more effectively with Forgotten Australians if they understand what makes them who they are. Some people—including the survivors themselves, but also others—will find it disturbing and distressing. These personal stories, and the vision of Children’s Homes, are emotional and confronting. They are also moving and powerful, showing the strength of survivors and the things that inspire them to work for a better world. Forgotten Australians or others who have experienced childhood trauma should consider seeking out the support of family or a trusted friend or counsellor when viewing these stories. Educators should consider the potential impact when deciding what supports to offer to students who may be affected by it. Team leaders and managers may wish to offer supervision/debriefing for staff. 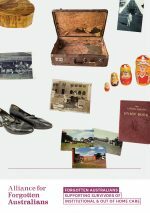 Produced by the Alliance for Forgotten Australians with support from Families Australia and funding from the Australian Government Department of Families, Housing, Community Services and Indigenous Affairs. The Caring for Forgotten Australians, Former Child Migrants and Stolen Generations Information Package shows how early life experiences can affect older people receiving care and help care providers respond to their needs. a training facilitator guide including case studies on care issues of Forgotten Australians, Former Child Migrants, and Stolen Generations. Carers are encouraged to use this guide to facilitate group discussions and information sessions to other carers. Aboriginal and Torres Strait Islander people are warned that the Package’s resources may contain images and voices of deceased persons.